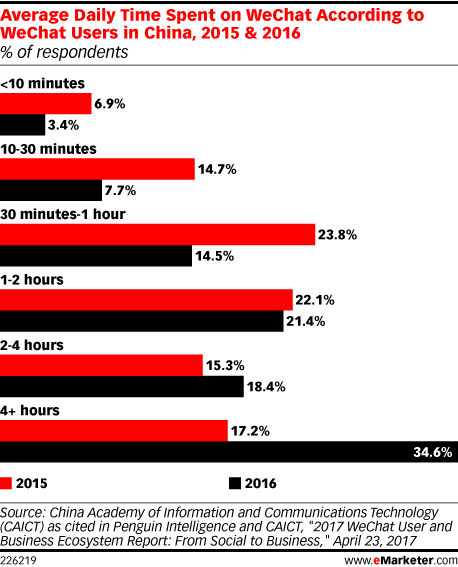 Data is from the April 2017 Penguin Intelligence and China Academy of Information and Communications Technology (CAICT) "2017 WeChat User and Business Ecosystem Report: From Social to Business." Data in the report is established based on an online survey conducted by Penguin Intelligence, for which 19,511 mobile internet users in China were surveyed online during March 2017, and a CAICT study, which covered 1,100 WeChat users and 9,018 WeChat public accounts, conducted in 2016. Penguin Intelligence, an independent subsidiary of internet company Tencent, is a digital research institution based in China. China Academy of Information and Communications Technology (CAICT), a subsidiary of Ministry of Industry and Information Technology (MIIT), is a scientific research institute.